Gov. Eloy S. Inos died yesterday after a protracted battle with diabetes, making him the only CNMI governor to pass away while in office. He was 66 years old. News of his passing at 9:42 yesterday morning, Dec. 29, was confirmed by administration officials around noon. The Commonwealth and United States flags soon flew half-staff outside the Office of the Governor and all over the Commonwealth. Lt. Gov. Ralph DLG. Torres, who took over the reins of government, is now the youngest ever to serve as CNMI governor. Thirty minutes into a 9am meeting yesterday, Torres and his staff were abruptly called out and informed by the Inos family of the governor’s passing. The lieutenant governor was sworn into office at 11:45am yesterday in a private ceremony in his office, officials present at the ceremony said. Inos will be remembered as a father figure, mentor, and meticulous mathematician and friend, who cared and thought deeply about the betterment of the Commonwealth, according to multiple interviews with lawmakers, Cabinet, and other officials on Capital Hill yesterday, as officials—some teary-eyed and visibly pained—filed in and out of the building of the Office of the Governor. Inos died in a Seattle, Washington hospital on Monday, mainland time. Despite initial signs of improvement after a surgery earlier this year, his condition deteriorated, the administration said in a statement yesterday. Details from his doctors of his medical condition were not available, and the exact cause of his death or whether he was in a coma when he passed were not available as of press time. Inos’ rise to power was unprecedented. A former Finance Department secretary from 2006 to 2009, Inos was appointed lieutenant governor by then-governor Benigno Fitial in 2009, after the previous lieutenant governor, Timothy Villagomez, resigned after being convicted of federal corruption charges. Inos ran with Fitial for re-election later that year and won. He succeeded Fitial in 2013, when Fitial resigned after being impeached in office. Inos was re-elected last year November. 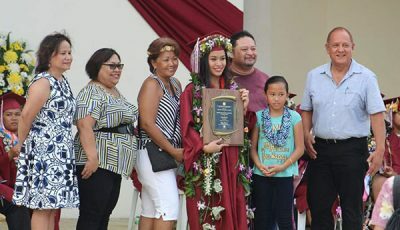 Rep. Angel Demapan, who served as a press secretary under both Fitial and Inos, recalled his close and personal connection to the governor, whom he considered a mentor and one that he emulates. “How hard he worked despite his sickness, how hard he worked just because he wanted our people to live in a community that prospered” is how Demapan will remember Inos. Inos’ passing came as a shock to the CNMI on Tuesday, just two days after the Christmas Day weekend ended. Labor Secretary Edith Deleon Guerrero said she received an email yesterday for a Cabinet meeting at 11:30am. She was happy, thinking that they were going to Skype or FaceTime with the governor to wish him a belated Merry Christmas and a Happy New Year, she said. But then suddenly she received a call that informed her otherwise. Commerce Secretary Mark Rabauliman remembers Inos as fair and accommodating—a leader that enabled his Cabinet to run their department to what he envisions, but find a way to get to that goal. Inos served many years in local government. He was deputy director and director of Finance under the Trust Territory of the Pacific Islands from 1982 to 1987, and director of Finance for the CNMI government from 1987 to 1994 under both the Pedro P. Tenorio and Lorenzo Deleon Guerrero administrations, according to a biography available on the CNMI government website. Oscar Babauta, an Inos administration official and former House speaker, asked the people of the Commonwealth to pray for the repose of Inos’ soul, and offer prayers for his family. Babauta said Inos always had the tendency to quiz family members and professional friends to test the ability and caliber of the people that he encountered. That’s what he admired about Inos the most. During his several years as governor, Inos oversaw the arrival on Saipan of an unprecedented casino industry, whose exclusive licensing fees helped bail out a collapsing NMI Retirement Fund. 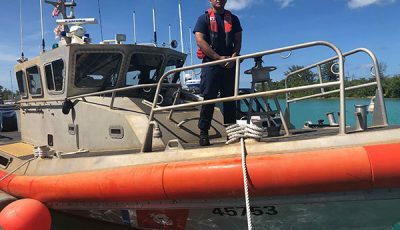 Recently, Inos issued an executive order to task the formation of an interagency task force to fight the war on methamphetamine, or ice, which has been plaguing the CNMI. He also recently challenged the U.S. military’s plans to conduct live-fire training and bombing on Pagan and Tinian, calling them moves that would radically and unilaterally alter the federal and local legal foundations that established the CNMI and set up its relationship with the U.S. and the amount of land and activity allowed for military training. In light of this issue—and the impending expiration of the contract worker program in 2019—Inos in November called for direct consultation with the U.S. White House.